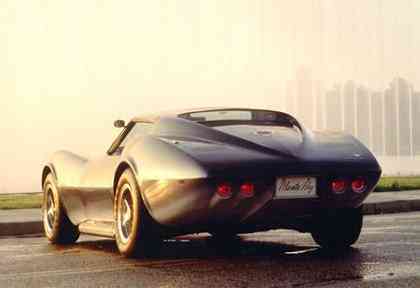 Chevrolet show car stylists and designers sure knew how to milk a prototype. 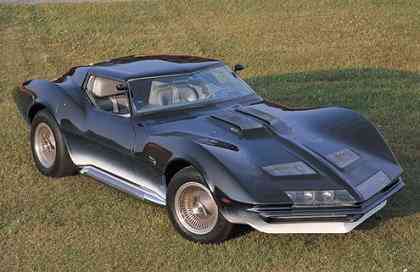 The Manta Ray was actually the 1966 Mako Shark with a few upgrades. The front end had a pointed chin spoiler and the headlights used 2 banks of 3 quartz-hallogen lights. The covers for the side pipes eventually showed up as an option on the ‘69 Corvette Most dramatic was the all-new roof line. The Stingray-like pointed roof with its louvers was replaced with a long, pointed, scooped out design that was very cool. The Manta Ray also packed the new, lightweight, all-aluminum ZL-1 427 engine! Even though the shark-inspired ‘68 production Corvette was in showrooms, the Manta Ray was just too cool to retire just yet.